As she was researching shows for this 13th season, the title Making God Laugh jumped out at Tabard’s executive director, Cathy Spielberger Cassetta. Intrigued, she started corresponding with the playwright, Sean Grennan. As she says in her program notes, she found “merit, wisdom, and folly in it” and decided to add this little yet-to-be-published gem as one of the “Twists” to the season. 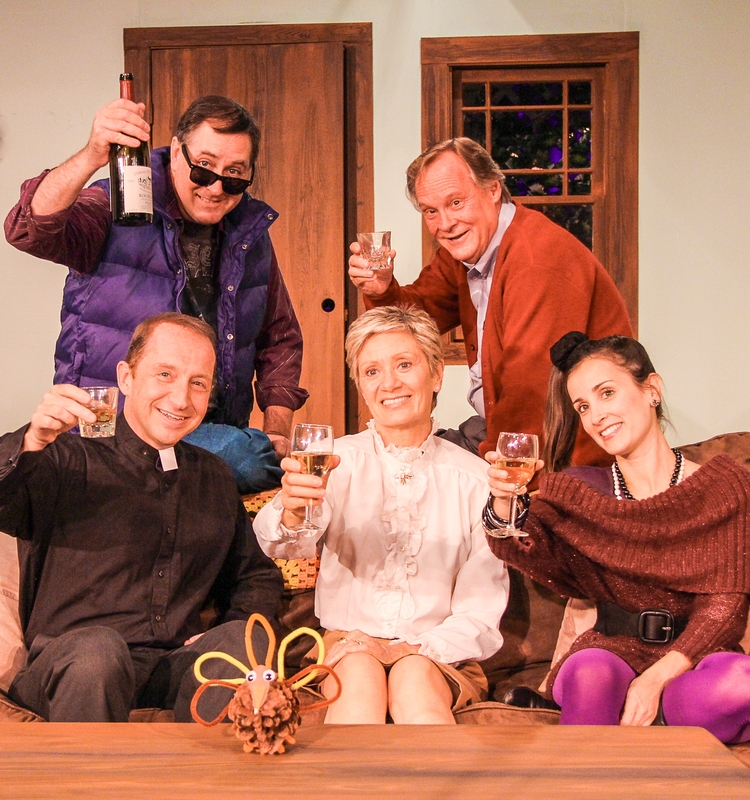 Grennan describes his play as a “dramedy that takes place in four scenes at a family home, each ten years apart.” First is a Thanksgiving dinner in 1980 and the play continues with one scene per decade until spring of 2010. Grennan too has a program note and says “all playwrights have to write their Family play.” This is his, and Grennan’s characters are each familiar in some ways. The script is very funny, and he uses several pop-culture references both in musical quotes (e.g., “Jet Song” from West Side Story, “Everything’s Comin’ Up Roses” from Gypsy, Lightfoot’s “If You Could Read My Mind”) along with some period-specific failures (e.g., AMC’s Pacer, Yugo, Enron) to help hammer home the points he’s making. Ruthie (Beverley Griffith) is the matriarch. She wants only the best for her children (in her mind at least), but she can’t help playing favorites to some degree. Bill (Steve Lambert) is the patriarch trying to hold this family together. He moderates the disputes and tries to keep things an even keel. Richard (Kevin Kirby) is the eldest son and is a bit of a buffoon. He’s a former football star who’s trying to be an entrepreneur, but he doesn’t always make the best choices. Maddie (Alexandra Bogorad) is the middle child. She’s an actor, a free spirit, and she’s also the most picked upon by Ruthie. Finally, Thomas (Ray D’Ambrosio) is the baby of the family. He’s his mother’s favorite and starts the play on the road to becoming a priest. He’s kind, gentle, and blessed with a warm sense of humor. The single set is lovely. All of the events take place in the living room, and most of the touches are there. The family is devoutly Catholic, and several religious paintings and artifacts adorn the warmly painted walls. The front door is upstage center adjacent to an undressed window which gives us a view of who’s coming to the door. Archways up stage right and stage left lead to the back hallway and the kitchen respectively. The living room furniture is perfect for this family of five with a couch and two easy chairs. A turntable is down right adjacent to an LP record collection. Just past the edge of the stage, screens are mounted left and right and are used to both display the year of each scene as it starts, and to show a nice slideshow of the decade, year-by-year, between the scenes during each act. We see shots of famous families, real and fictional, and of events throughout the 1980s and the 2000s, the slides accompanied by a suitable soundtrack. Director Doug Baird had good material to start with, both in the script and in his cast, and he combines them nicely. The cast members work very well together, and they are clearly comfortable with one another. All have some very funny lines, and they seem to take turns playing straight man. While the script calls for the “kids” to be actors in their 20s and the parents to be middle aged (see: http://seangrennan.net/theatre/making-god-laugh) all aging 30 years, Kirby and D’Ambrosio are closer to their end ages and play younger in Act 1. Kirby and Bogorad are aided by period-appropriate wigs though Kirby’s might be mistaken for house pets if they had feet. Costume designer Marilyn Watts kept Lambert, Griffith and D’Ambrosio’s costumes very conservative and proper. Kirby and Bogorad, on the other hand, are dressed quite trendily in the most outlandish fashions from the 80’s and 90’s. By the time they get to 2000, their clothes fit more into the mainstream, almost. Griffith captures Ruthie well. She’s commanding, yet old fashioned, and although she’s a native British English speaker, she maintains a believable American accent that sounds just a bit cultured. She’s a little tentative with Lambert. While we don’t find out why until much later in the play, it is in character, and they have some touching moments together. Ruthie has a unique reaction to each of her children. She greets Ricky warmly on his first arrival, but she doesn’t hug him. Ruthie is hardest on Maddie. Before long, Ruthie and Maddie throw verbal jabs at one another, and Griffith and Bogorad are very believable as they spar. Ruthie bear hugs Thomas when he first arrives. D’Ambrosio’s expression is priceless as Thomas looks rather embarrassed at all the attention. Ruthie’s dubious holiday recipe makes several appearances, each time looking disgustingly unappetizing, but the family has its way of handling things. Bill and the kids are of one mind, but nobody dares to openly cross Ruthie. All that’s missing is a dog to help dispose of the evidence. Kirby, D’Ambrosio, and Bogorad banter back and forth as siblings nicely, shifting alliances two against one as the situation dictates, although Richard takes most of the abuse. At one point late in Act 1, Scene 1, just as they are getting ready for their holiday family photo, D’Ambrosio and Bogorad chide Richard’s use of the word “chick” with a smart rendition of the start of the “Jet Song” in harmony with the dance moves to emphasize their point. A particularly amusing scene in the play is New Year’s Eve going into 2000 at the top of Act 2. Kirby steals the show as he rolls into the house commando style, Richard clearly overreacting to the “dangers” of Y2K, attacking things with his baseball bat. Anyone who remembers the panic surrounding that year-end rollover will appreciate the sentiment. Once it’s clear that there is no danger, a real shocker is exposed, and the story gets much more serious from that point forward, though there’s still gentle humor throughout. The production isn’t perfect. There are a few minor script inconsistencies and performance missteps, but this is a strong cast that can fill any holes and keep the show’s continuity intact. The cast members clearly understand the nuances of their characters, and they bring out the subtleties that make them all come alive. Tabard is fortunate to have found this show that fits its venue and its audiences so well. The comedy hits home making you laugh out loud, but when the tables turn, the guffaws will quiet, and tears of joy and admiration will take their place as the play’s final scene touches your heart.